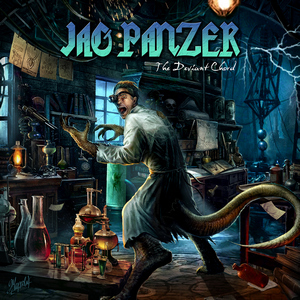 Jag Panzer’s American bred style of traditional/power metal has made it to album number ten with The Deviant Chord, their first album since The Scourge of Light back in 2011. Even with all the breaks/hiatuses the band has taken over the years, there is only one member on this album who was not a part of their incredible debut Ample Destruction back in 1984. Only drummer Rikard Stjernquist did not, and he has been with the band nearly 30 years himself. The first thing that strikes you about The Deviant Chord is the wacky sci-fi gimmick of the album art, something that was missing from its predecessor, which was pretty but lacked that “wow factor.” Vocalist Harry “The Tyrant” Conklin sounds as good as he ever has, and unlike many classic bands, modern production lends itself to the band’s sound. The bass is fat in particular on “Salacious Behavior” as John Tetley does his best Steve Harris impression. The album has great variety from the opener “Born of All Flame” to the cover of Celtic folk song “Foggy Dew,” which strikes a chord with a similar style to how Slough Feg would handle a song like that. So many classic styled bands have started to pop up over the years with groups like Enforcer, Striker, Eternal Champion and Sumerlands and those rising from the dead like Satan (who set the bar especially high). It just helps to put The Deviant Chord in perspective. This is a bona fide classic metal album from any era and stands toe to toe with Jag Panzer’s back catalog. If you are looking for one traditional heavy metal album this year, it may well be this wonderful release.